There’s been a serious gunfire incident with 15-20 shots fired, likely from a high-caliber automatic weapon, at the corner of Euclid & Mozart streets in Adams Morgan this evening. Police were on the scene within 2-3 minutes this evening, with DC Fire EMS shortly thereafter. There was at least one victim transported to an area hospital in critical condition. 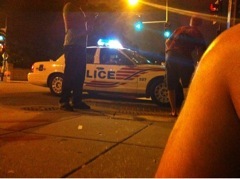 More as we get it, We Love DC’s Dave Stroup is on the scene in Adams Morgan. Update, 9:50pm: One victim in critical condition was taken to an area hospital undergoing CPR in transit. Detectives are on the scene, but not yet speaking with press. Witnesses say a large group of teens was spotted fleeing the scene. We get the impression that several of the witnesses are not being forthcoming with police at this time. Officers are looking for access to nearby buildings to gather security camera footage. Note that there is an MPD camera box at 17th & Euclid, one block up. Update, 10:45pm Officers have continued to lock down the area, and nearby cars are not permitted to be moved until the crime scene processing is complete. Several vehicles have been hit with stray bullets. Victim likely was taken to Howard University Hospital, but we cannot confirm that at this time. The brother of the victim was not allowed to leave with the victim to go to the hospital, but was detained to speak with Police remove his car from the scene, and had to leave the vehicle there and proceed to the hospital via bus. Ward One Council Candidate Bryan Weaver was on the scene, and expressed worry that this might have something to do with recent murder arrests. We’ll have more in the morning. Update, 9:45amThe victim’s injuries proved to be fatal. Last night’s reports of automatic weapons fire may also have been premature: it’s also possible that we were hearing an exchange between two weapons, but the shot counts are still the same. As of 12:22PM the streets are still closed and motorists are not permitted to move their vehicles. Which is part of an ongoing effort to get district residents to switch to bicycles. R.I.P. Skeeter… May God be with Minnie, and the rest of your brothers and sisters. No worries now. It’s all over.